For 20 years, military safety leaders, civilian experts, trainers, and critical safety staff met onsite at an annual safety conference to share safety data, discuss best practices, and learn about ways to employ innovative ideas in their field. However, recent budget pressures jeopardized the Department of Defense’s (DoD) ability to carry on with the critical safety training. Historically, safety conference coordinators would complete detailed requests for conference space, presentation equipment—including computers, projectors, whiteboards, tables, and printed materials—for each session. Onsite assets and personnel were also required to ensure presenters and participants were where they needed for each session and coordinate travel and accommodations for speakers. Six weeks prior to its 21st annual conference start, organizers realized that many people would be unable to participate in San Diego, California because of budget—the travel costs were just too high for a globally-based force. Doing nothing wasn’t an option and completely reorganizing another live event wasn’t feasible. NAVSAFENVTRACEN had to examine alternatives. A new idea—executing the conference virtually—emerged among the leadership team. Given NAVSAFENVTRACEN’s desire to innovate, the consensus was quick and event organizers pushed forward with the new plan. Now in it’s sixth year of virtualization of the event, it continues to grow in scope and attendance. In 2017, the event provided access to training and development for over 2,300 service members and industry safety professionals while covering 23 countries with 120 sessions and every timezone around the world. With the Adobe Connect platform, participants joined the event seamlessly across computers, tablets and mobile devices using Adobe Connect’s mobile app. In addition to the participants being located around the world, presenters also were geographically dispersed. Senior safety leaders also addressed the participants directly from the Pentagon and Norfolk, VA. 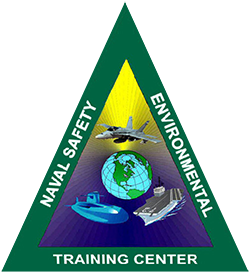 Success using Adobe Connect at its annual conference helped to reaffirm the Naval Safety & Environmental Training Center’s choice to employ eLearning as a critical platform. Demand for eLearning and web conferencing has grown from 800 students regularly attending courses in 2013 to more than 2,500 in 2016 and expectations for continue expansion. NAVSAFENVTRACEN believes more DoD personnel will want to participate in virtual courses to better accommodate their already busy schedules. Live and recorded courses with Adobe Connect makes learning more convenient without sacrificing the learning experiences. At the same time, trainers can measure participation, and engage learners directly, helping to increase accountability for students learning the material. The agency’s ability to measure success with Adobe Connect for online learning has helped drive the decision to expand eLearning training programs and expand opportunities for more DoD personnel to attend training and the annual safety conference virtually. 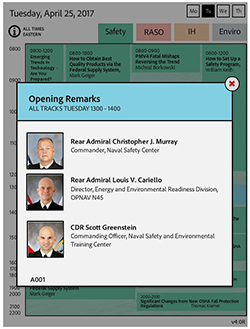 To support the multiple day and multiple track aspects of the event’s agenda, an interactive schedule (iSchedule, shown at left) was created to provide detailed session information, speaker information and as a launch point for the Adobe Connect virtual rooms. 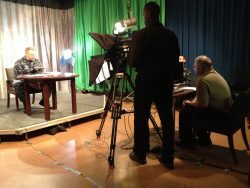 After the event was concluded, the links to the live rooms were converted to links to those sessions that were recorded. View the live 25th Anniversary iSchedule here.